A vision of white, gold and musk, Munich Nationaltheater may be the ultimate music box opera house. Practically every seat is a good one, and the acoustics are amazing. Audiences dress as if every night is opening night, and fill the house early to await the performance with eager anticipation. And rarely is that anticipation higher than when the leading man in none other überstar tenor, and Munich native, Jonas Kaufmann. This new production, directed by Martin Kušej, boldly updates the action to a war-torn region in the modern day. The motivation of the characters translates surprisingly well, although the setting is sparse at times and generally unattractive. We begin during the famous overture at a somber family dinner in an austere European home. Leonora, clearly anxious, awaits her lover, Don Alvaro (Kaufmann). 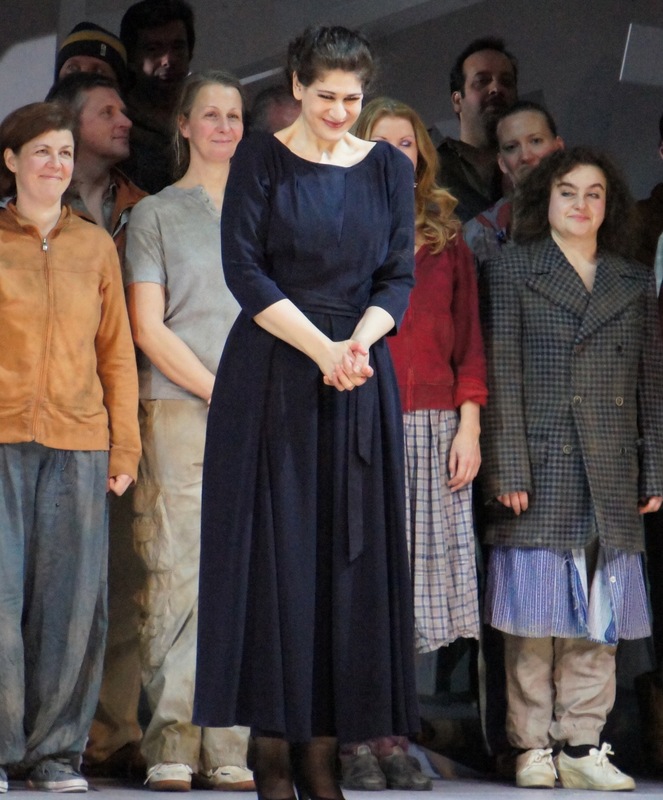 As Leonora, German soprano Anja Harteros scores a major triumph, singing the role with lush vocal beauty, and portraying the trouble young woman’s journey with great dramatic effect. With Leonora’s first aria “Me pellegrina ed orfana,” Harteros establishes the crystalline beauty of her vocals and fully engages our sympathy with the vulnerable character. 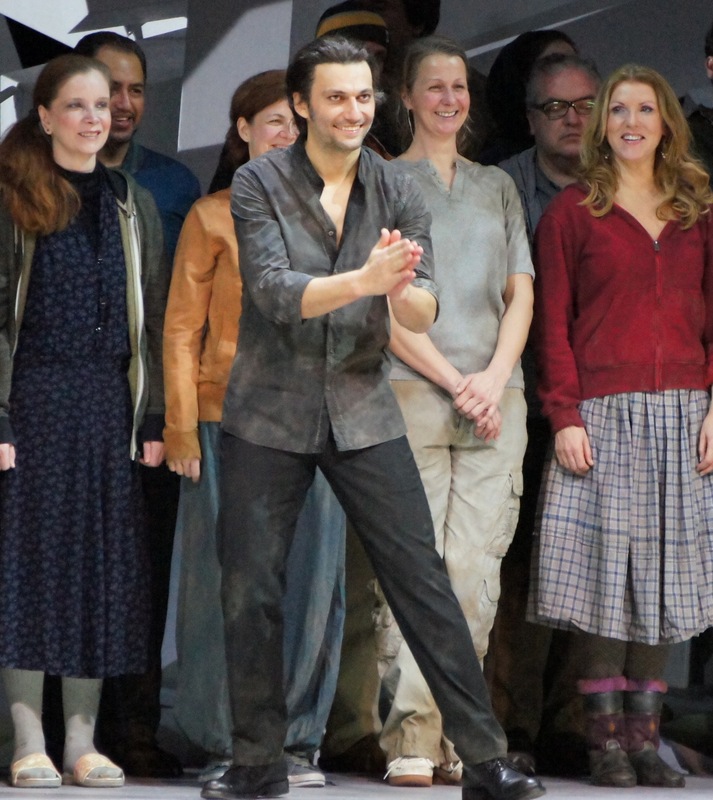 Alvaro enters, and the lovers’ closeness is clearly established through a fun and lively scene of duets beginning with “Ah, per sempre.” As Alvaro, Kaufmann cuts a dashing figure with long hair and tight-fitting shirt and pants. In superb voice, the reliable brilliance of Kaufmann’s performance is greatly enhanced by the excellent singing of his wonderful colleagues. The violence that follows is due, in part, to the mafia-like bodyguards of Leonora’s father, the Marquis. The accidental shooting of the Marquis is dramatically effective, followed by a clever touch from Kušej: Leonora’s brother, traumatised by the shooting, grows up before our eyes as three actors play the role in rapid succession. This is also helps to explain, later in the opera, why Alvaro does not recognize the fully grown Carlo as he was only a young boy when Alvaro was with Leonora. 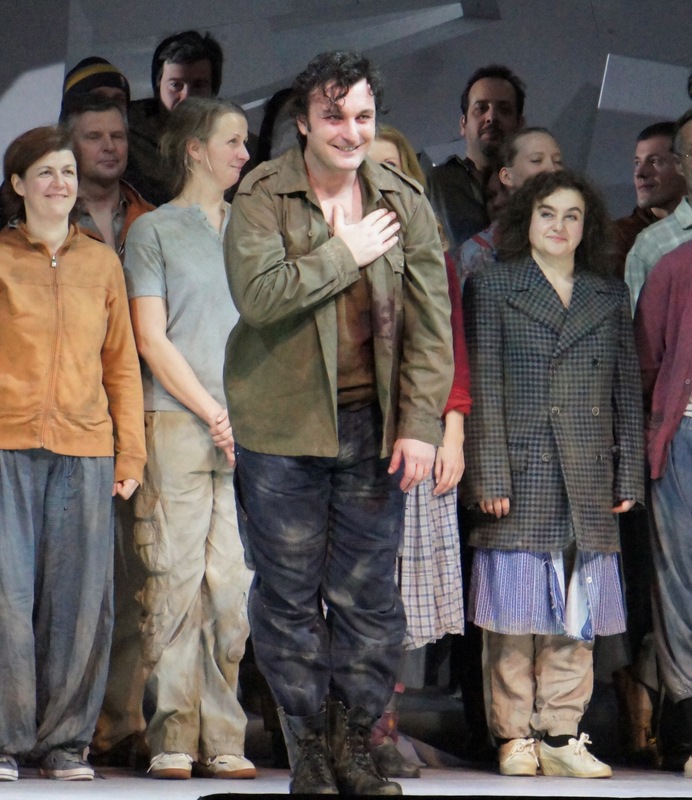 Another particular choice of Kušej’s becomes evident at the start of act two: the family dinner table is to stay on stage for the whole opera to represent the memory of that fateful night to all who were there. In fact, the Marquis’ dead body still lies in place for scene one of act two. A huge chorus of shoppers dressed in pale greens and greys forages for items in front of a rear wall torn dramatically in two horizontally across the middle. The impact of gypsy Preziosilla is somewhat undermined by her simple modern dress. Nadia Krasteva overcomes this well, providing plenty of stage presence along with her expressive mezzo soprano voice. The second superb colleague to share the stage with Kaufmann is Ludovic Tézier, as Don Carlo. Tézier’s baritone is as bright and rich as a trumpet, and is projected forth with thrilling power and clarity. Act two continues is a sparse monastery. Yet another interesting angle from Kušej is the double casting of Vitalij Kowaljow as both the Marquis and Padre Guardino. The final section of duets between Leonora and the Padre, “Sull’alba il piede all’eremo” ends in a rather amazing shared long note. Before the hymn “La Vergine degli Angeli,” Leonora is baptised in a large round white pool. The three scenes of act three are set in a massive underground lair, where levels of platforms seem to have been ripped apart by bombs. Following some exquisite clarinet playing from the Bayersiches Staatsorchester, we are treated to Kaufmann’s virtuosic rendition of “La vita è inferno all’infelice … O tu che in seno agli angeli.” Dramatic lighting represents the battle, then, as part of the modern setting, Carlo discovers Alvaro’s identity by taking the wallet from the injured man’s back pocket. 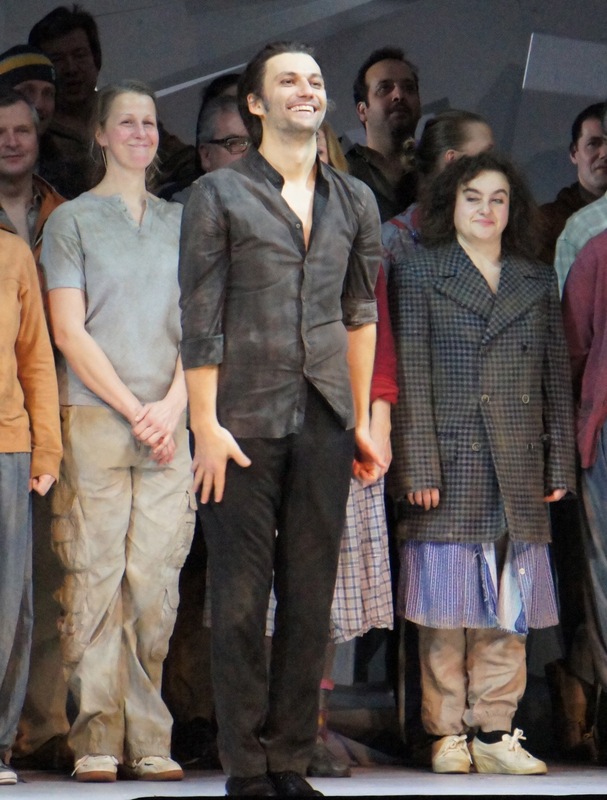 Kaufmann and Tézier’s combined singing and acting is magnificent. Back at the monastery, Padre Guardino is overwhelmed by beggars seeking the plastic containers of food that he has neatly stacked to distribute to the poor. Based on Leonora’s fervent devotion to the crucifix, the set for her “cave” is a giant pile of large white crucifixes, which makes for a striking final image to the opera. The concept of the family dining room table remaining on stage is completed when Leonora, Carlo and Padre Guardino/the Marquis all lie dead in their original seating placements from the opening dinner scene. A fascinating, if somewhat controversial, update of the opera overall, with the magnificence of the singing and the music overpowering any of the stage concepts to come across as the main attraction by far. 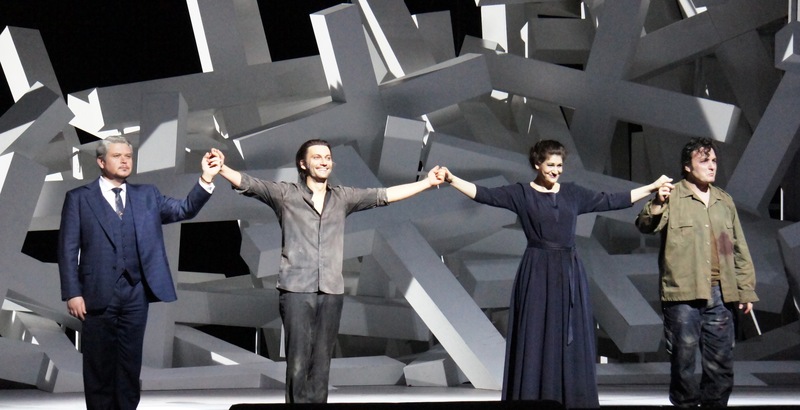 La Forza del Destino was reviewed on 5 January 2014. 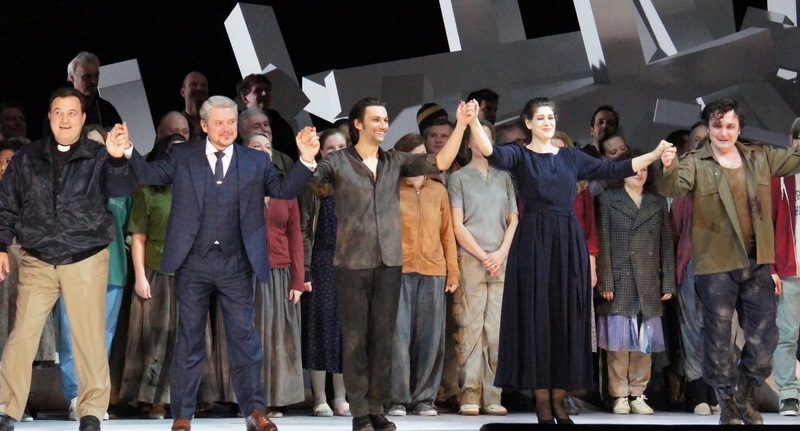 It continues at Nationaltheater, Munich on 8 and 11 January 2014, before returning in July 2014. To see production images of La Forza del Destino, click HERE. Thanks for your feedback, and for giving me this correction so nicely. You are definitely correct and I have made this change now. I am glad that you were also able to watch this wonderful performance.